Are Inexpensive Dentures Good Value for Money? Few people have money to spare these days. Looking for inexpensive dentures can be one way of keeping costs down. But what do you get for your money? Do low cost dentures have a lot of problems? Most importantly - what do I mean by "inexpensive dentures"? If you consider that a normal set of dentures (upper AND lower teeth) usually starts at around USD2000, I would consider "inexpensive" to be anything at half that price or less. SO, we are looking for dentures (upper and lower) for UNDER USD1,000. But we can do better than that! Depending on your town or state, the dental group Affordable Dentures can even start off below $400! How can anybody offer a full set of dentures at that sort of price? There are several areas where expense can be trimmed while still giving you value for money. The first area is working efficiently. For example, all offices that are part of the Affordable Dentures group have their own dental laboratory on site. Straightaway, this cuts out the cost of the lab guy having to make a profit. The lab is owned by the dentist, and he can run it at break-even, passing the savings on to the patient. YOU! Next, by semi-specializing in low cost dentures, the office can be set up and equipped so that the dentist can work more quickly than normal, minimizing the time he needs to spend on each case. Another example of efficiency is the way Affordable Dentures offices furnish their rooms. They are comfortable and attractive, but not luxurious. You won't see any italian marble statues or expensive hardwood floors. More expense spared. After all, the quality of your dentures will not be affected by the office decor! How can I know if low cost dentures will be OK for me? You have worn dentures before for a number of years, with no problems, and your current dentures are just getting a bit loose . You don't have any problems with your current dentures, but they are just chipped or cracked. Maybe the teeth have chipped here or there, or you can see a crack developing in the denture base. You have very definite ideas about how you want the teeth to look, for example the precise positioning of each individual tooth. You have had problems with dentures before, such as getting them to stay in place, or hurting your gums. Read more about this at Denture pain. All in all, inexpensive dentures ARE available, and for most people they will work out just fine. They are a genuine alternative to full-cost dentures at a general dentists office. But there are some folks out there with more complicated requirements, who may need a more personalized custom fitting service. For example, the shape of your lower jaw may not give much support for a lower denture, and you have had problems in the past getting a lower denture to fit comfortably. In this case, you will be more likely to get a well-fitting denture by using the services of a denture specialist, and getting their "custom fit" service. For example, the most expensive dentures from Affordable Dentures are probably getting close in price to a normal set from a general dental office. BUT remember that Affordable Dentures specializes in making dentures, and their "top-of-the-range" dentures will be the equivalent of $5,000 dentures from anywhere else! To sum up, inexpensive dentures are definitely a realistic option for many people. 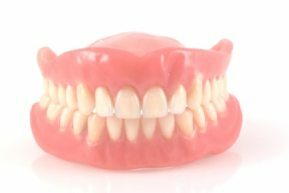 Unless you have specific problems, I would recommend a specialist franchise such as Affordable Dentures for your low cost dentures. ALSO - for those folks out there that need (or want) more stability for there dentures, Affordable Dentures also offers DENTAL IMPLANTS to help in difficult situations.